Did you know that some root vegetables have greens that you can eat? I’ve tried beet and radish greens so far. Here is a recipe that was successful for me. I created this one, but the Blender Girl Smoothies cookbook has other, fancier ones. Happy drinking! Blend this one a little longer than you usually do. The greens are hard to break down. The results are delicious! 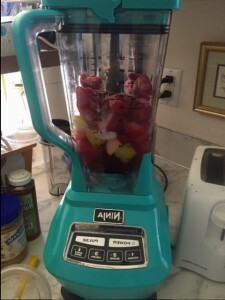 This entry was posted in recipe, Smoothie and tagged beet greens, heather hiestand, smoothie on July 13, 2015 by Heather.